SAN FRANCISCO, Oct. 23, 2018 /PRNewswire/ -- A nationwide survey conducted in August finds that 94% of U.S. respondents considered their last customer experience positive – although they note there is still room for improvement on the margins. 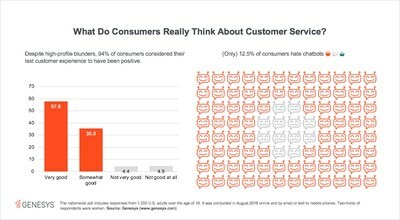 While high-profile customer service blunders by major companies gobble media attention, new research from Genesys (www.genesys.com) challenges the notion that companies aren't in touch with consumers and provides insight into how businesses can adapt their support options to meet evolving preferences. Genesys Chief Marketing Officer Merijn te Booij said, "It's straightforward – the results of the survey indicate consumers want a blended approach. They want the rapid access to a business that digital channels can provide, combined with the human touch when they want it." Consumers put a timely response (64%) and knowledgeable agents (55%) at the top of their list for the type of customer experiences they value the most. Concurrently, 67% of respondents say it's very important that companies quickly route queries to a customer service agent who has background information and understands the customer's needs. "It's clear from the research findings that businesses need to strike the right balance when deploying digital channels, automation, and artificial intelligence (AI) in customer experience," said te Booij. "We think it also means it's safe to say that the role of humans in customer service isn't going away anytime soon – unless a business is willing to sacrifice customer satisfaction. However, we do believe AI will continue to change the way humans work and how consumers get service for the better." He went on to explain, "Interestingly, businesses can use AI to alleviate consumers' biggest pain points in service when applied strategically and in concert with human effort. AI really is the key for enabling consumers to have their cake and eat it too — in this case that means fast, efficient, knowledgeable service at the hand of a human or even a bot when they choose." Today, brands cannot afford to ignore the importance of delivering the type of service consumers want. 72% of U.S. respondents say they have sometimes or always bought something from a business based solely on its reputation for customer service. Further, 89% of respondents have taken action as a direct result of poor customer service. A full 58% say they have switched providers as a result of poor customer service, and 49% say they have never done business with a brand again after a bad experience. Nearly 50% discussed their disappointment face-to-face with family and friends and 24% even spread the word via social media. Keep those phone lines open! While voice is no longer the only game in town, consumers still want the option to call when they need customer service. In fact, 91% of U.S. respondents say it's important to engage with a business over the phone, with 54% considering it "very" important. Despite an increasing use of social media by businesses as a customer support channel, only 4% of U.S. consumers are fond of interacting with companies that way. Respondents cite discomfort, impersonality, unlikelihood of success and lack of speedy response as barriers. People value good service, with 44% of respondents saying they're willing to pay more to ensure better service. And yet the main reason to tolerate bad service? 42% polled say it's related to a low price. The nationwide poll includes responses from 1,000 U.S. adults over the age of 18 and was conducted online and by email or text to mobile phones. Two-thirds of respondents were women. Genesys also conducted the same survey of equal pool size in both Germany and the United Kingdom (U.K.). Look for additional insights from the Genesys survey in the coming weeks.